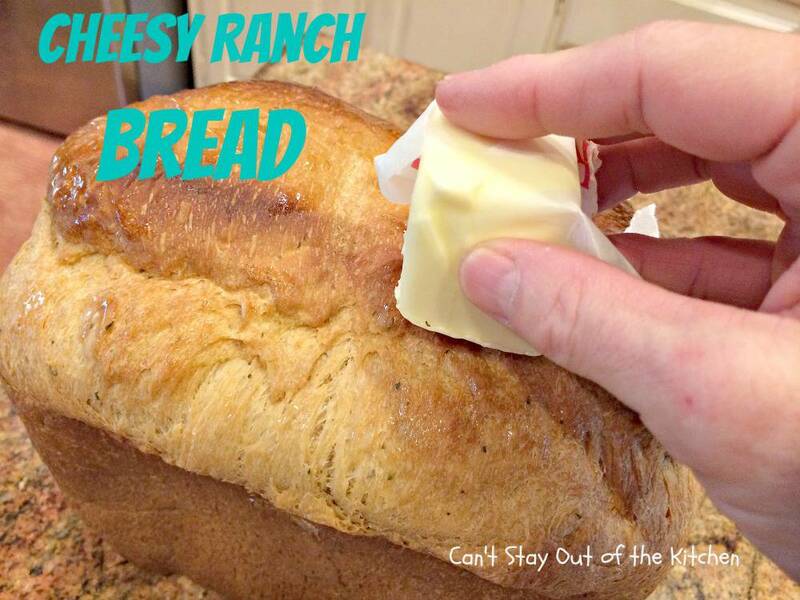 Cheesy Ranch Bread is one fantastic bread! Who doesn’t love lots of cheddar cheese and Ranch dressing? This lovely breadmaker bread includes Greek yogurt, dried buttermilk mix, and an egg as the ingredients along with dry Ranch dressing mix and cheese. 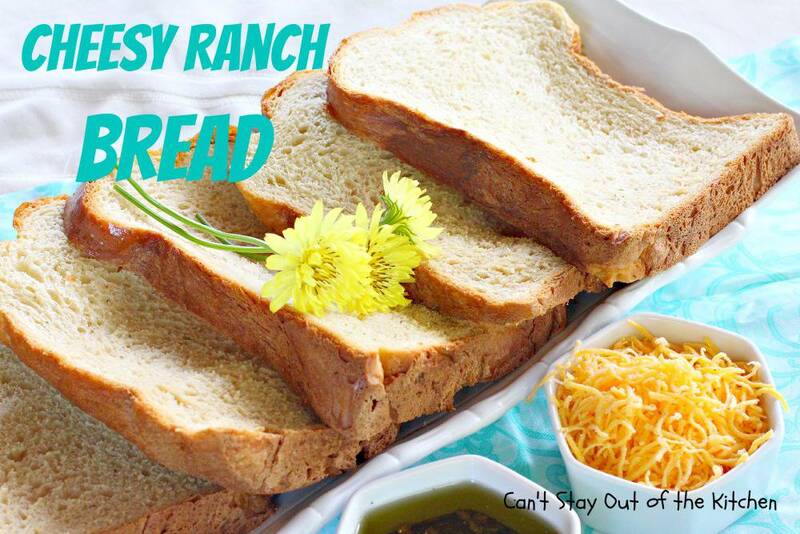 I loved it with butter slathered all over it, but it’s a great bread for dipping, too. 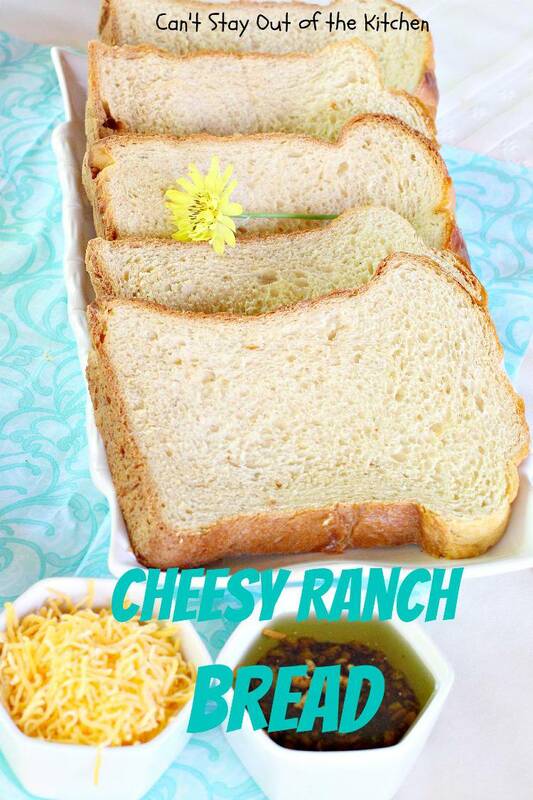 Cheesy Ranch Bread is sturdy, hearty and filling. 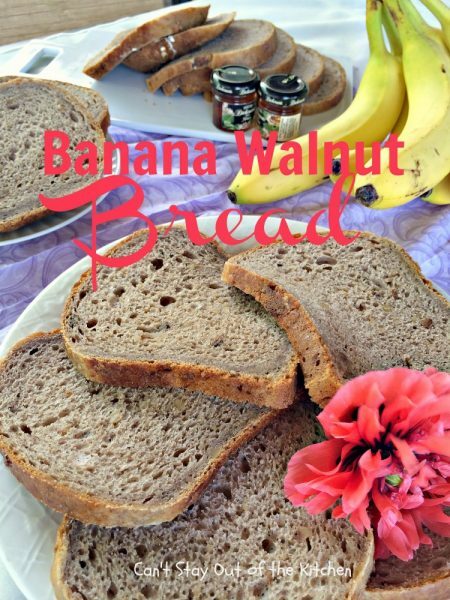 I would highly recommend it as a bread to grill sandwiches, too. 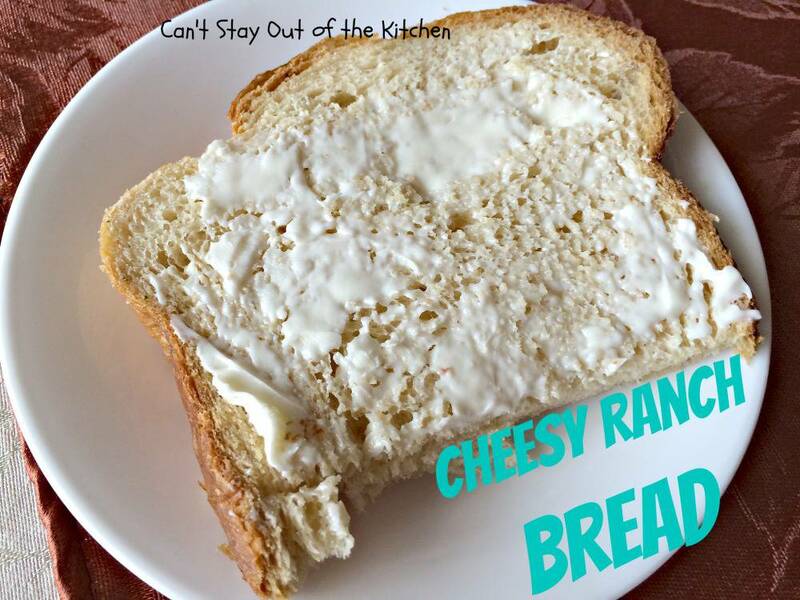 If you’re a bread lover like me, then Cheesy Ranch Bread is great comfort food. Last week I made a meal for some friends who were moving part of their storage stuff into a new house. I made up a batch of La Madeleine’s Tomato-Basil Soup, along with Cherry Strudel Cake and some of this delicious bread. It was awesome. While I sent most of the loaf to my friends, I did keep back a slice for myself and I savored every bite. This is another one of those recipes I found years ago online and had yet to make. I was going through new ones and this one sounded interesting. 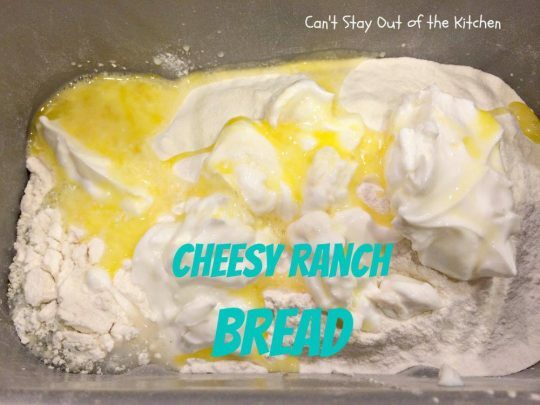 Then when I looked through the ingredient list and realized I had everything on hand, I decided it was time to give Cheesy Ranch Bread a try. I am so glad I did. Not only did I love it, but the family I took the meal to loved it as well. Cheesy Ranch Bread is a savory and delicious dinner bread. The combination of cheddar cheese and Ranch dressing mix included in the dough is spectacular. 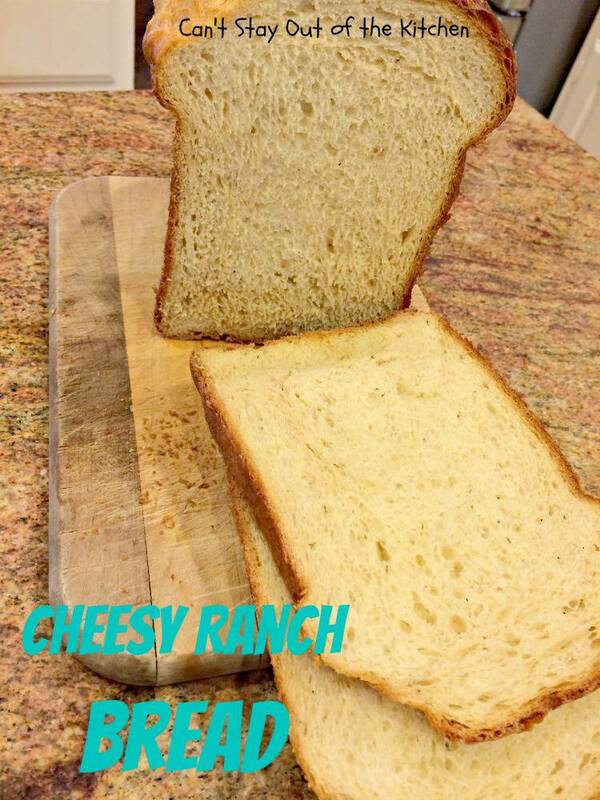 Here’s a close up of Cheesy Ranch Bread so you can see the texture of the loaf. These are the ingredients I used for the bread. Here, I’ve added water, honey, salt, dried buttermilk, dry Ranch dressing mix, bread flour (NOT ALL-PURPOSE FLOUR), Greek yogurt and a beaten egg. Now I’ve added cheddar cheese, yeast and vital wheat gluten. 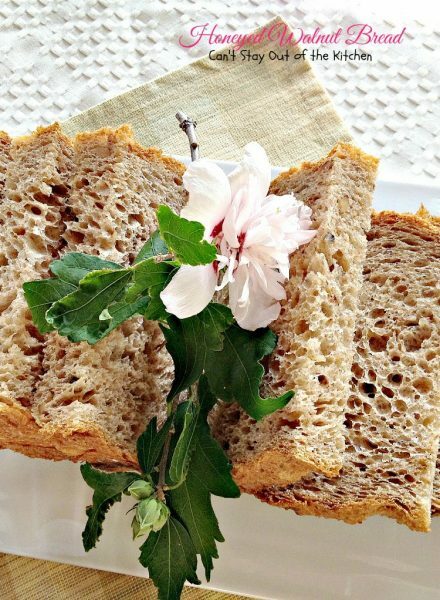 Bake on a wheat bread setting (even though this does’t use wheat flour) to get a little longer cooking cycle. This breadmaker takes about 3 hours 45 minutes. Allow bread to rest 15 minutes in oven after done. Then butter the top and sides of the bread to prevent hardening. 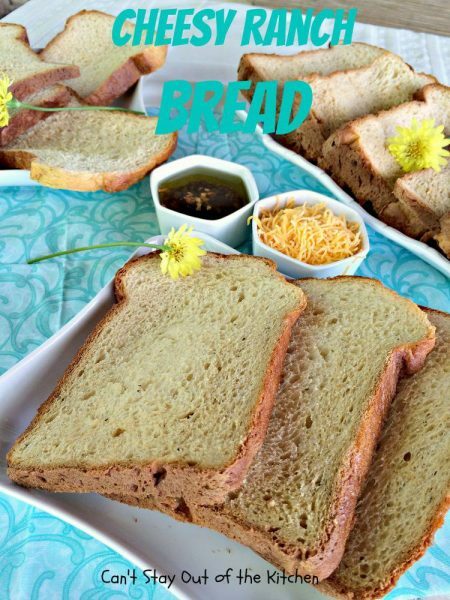 Allow bread to cool an additional 15 minutes before cutting down into slices. I use an electric knife to get nice, even slices. 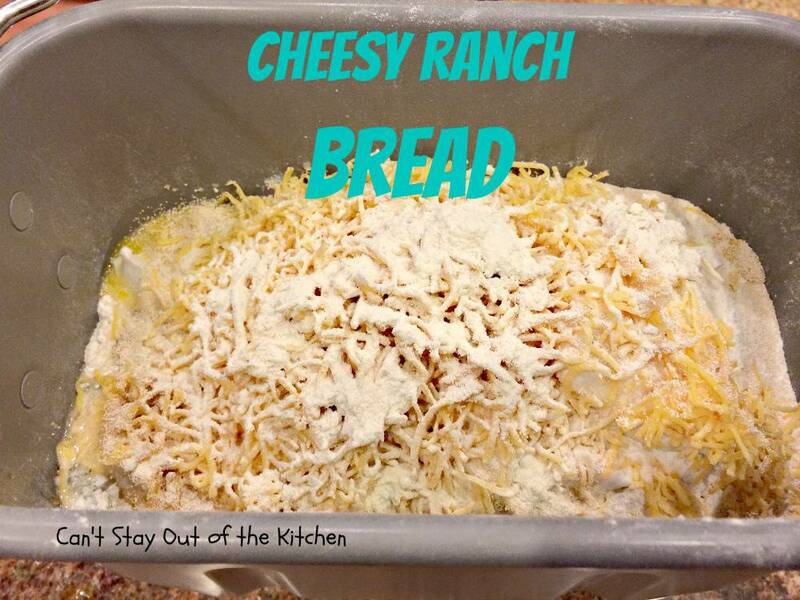 Cheesy Ranch Bread makes 10 large slices or 20 half slices. I spread my slice with butter and it was heavenly. 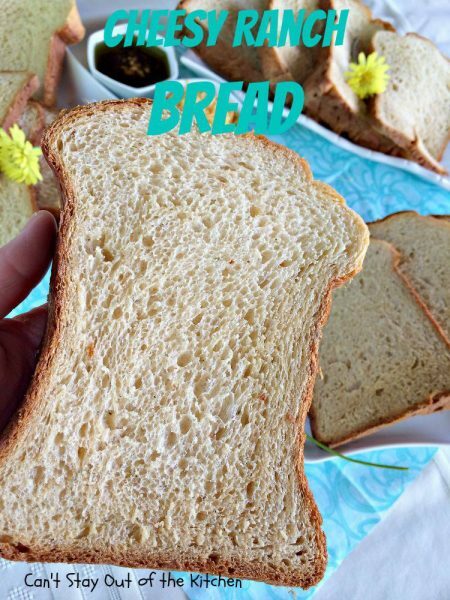 Amazing homemade bread recipe for the breadmaker. This one includes ranch dressing mix and cheddar cheese and is a wonderful savory dinner bread for any occasion. 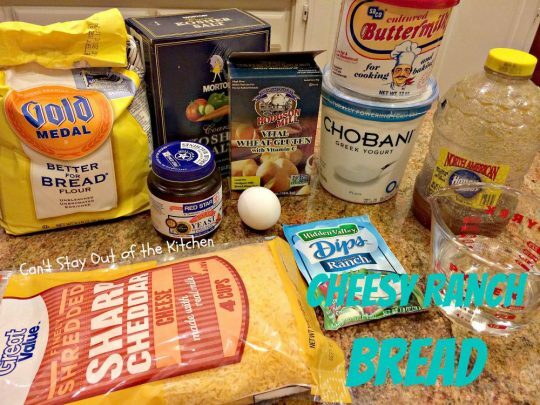 This recipe is for a two-pound loaf. After baking, allow bread to rest in breadmaker 15 minutes before removing. Brush top and sides of read with butter to prevent crust from hardening. 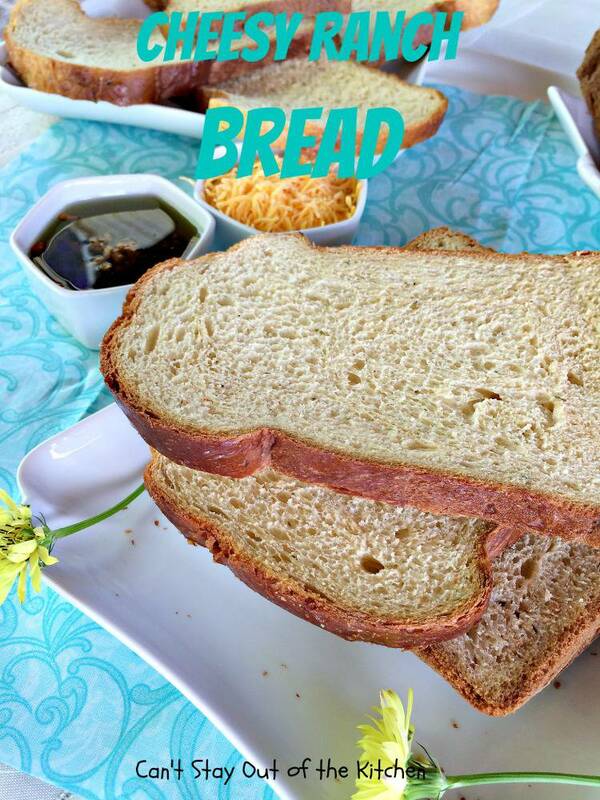 Allow bread to rest 15 more minutes before cutting down into slices. Makes a two-pound loaf, or about 10 large slices. NOTE: I found this bread did better at the longer wheat bread cycle rather than a shorter cycle. Recipe adapted from Cook's Recipes. I found this bread did better at the longer wheat bread cycle rather than a shorter cycle. 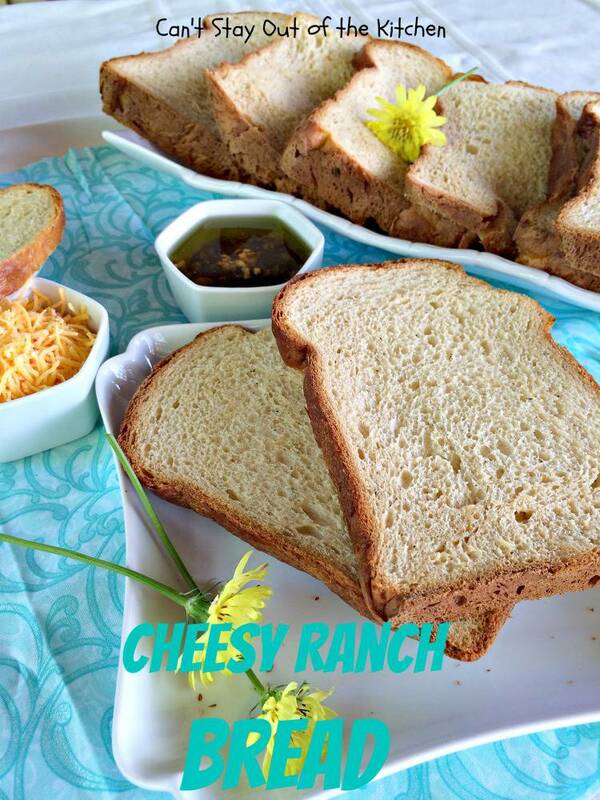 Cheesy Ranch Bread is great for dipping or using as a grilled sandwich bread. Cheesy Ranch Bread is hearty and filling and a great comfort food that goes well with any main dish. 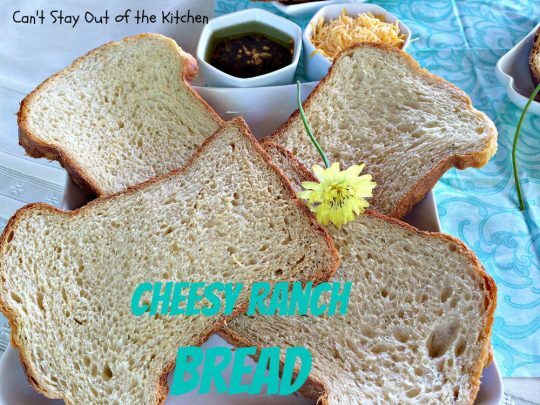 Every mouthful of Cheesy Ranch Bread was terrific!